I support the ongoing effort to keep the Dark Souls torch lit now that the actual minds behind that series are taking an indefinite hiatus. No game has quite nailed it yet – certainly not Hollow Knight – but to even attempt to mimic From Software’s work takes courage. An unwelcoming difficulty curve can easily alienate players if mishandled, and there’s tremendous risk in dumping detail into a world’s lore and making it obtuse to unearth. As derivative as Hollow Knight is, I would never call a project like this unambitious. On top of that, this game’s audiovisual appeal is through the roof – an adorable hand-drawn visual style makes Hollow Knight one of the prettiest 2D releases in recent memory. Characters move with exaggerated energy and speak a cute made-up language in delightfully cartoonish tones. Environmentally, each region is brimming with details that make it immediately distinctive from another. It’s not enough for an area to be rainy – water actually puddles up and runs glistening down walls. The moody soundtrack, sure to be one of the year’s best, complements each section perfectly. This world is a joy to take in, and yet, heaven help me, I can’t get enthused about Hollow Knight. Strip away the sharp presentation and its only unique quality among legions of Castlevania-style action-platformers is that it’s disappointingly bloated. Developer Team Cherry couldn’t even cough up any interesting upgrades, instead falling back on the bog-standard double jump, stomp, air dash, and wall-run. Aesthetically, this project is a treat. Mechanically, it’s nothing I haven’t seen a thousand times before. This isn’t to say that the insect-themed Hollow Knight is bad, though. In fact, it adeptly recaptures some key elements of the franchises it draws from. For all of the knock-offs that Symphony of the Night has spawned over the last two decades, this is one of the few that can claim to sport a truly branching, open-ended world. It’s a pleasant surprise not to have my hand held, and to be given actual agency over the order in which I tackle objectives. On the Souls side of things, Team Cherry doles out world-building in much the same way From Software did – piecemeal, and often hidden away for only the most perceptive players. As cartoonish as this universe may look, there’s depth to its mythos and a sense of geography to its locations. Adventuring NPCs pop up at various points through the game, giving me the sense that other stories are unfolding concurrently with mine. Seeing these quests to their conclusions is also a bit less roundabout than it was in Souls. Hollow Knight is also a pretty brutal game at times. The bosses play rough, the platforming segments put players through spike-laden acrobatic marathons, and upgrades are altogether rare. Expect to get very familiar with attack patterns. Not everything that Hollow Knight pulls from the Souls series fits especially well, however. After respawning, having to retrieve my lost belongings from the place of my death can be more than a little aggravating when there’s a platforming sequence requiring hyper-reflexes standing in my way, and being forced to stand still and vulnerable for a full second when I’m trying to heal makes no sense when bosses don’t have cooldown times. Developers, much love to you for taking inspiration from Souls, but try to consider why From Software did the things that they did. Hollow Knight also loses some technical points for being awash with framerate hitching. The game does a little dramatic pause every time the protagonist takes a hit – that’s deliberate and I don’t have a problem with it. Unfortunately, the game jerks and hiccups on a fairly regular basis, often while a lot is happening on-screen. It doesn’t look like much, but in a game that so harshly demands precision, even a fraction of a second’s worth of lost frames can have major consequences in tense situations. The biggest flaw, however, is the map system. Upon entering a new region, players can’t begin charting it out until they stumble upon the travelling cartographer, and even then, navigational data isn’t saved until the player rests at a save point. This means that every time players venture into uncharted territory, they remain in the dark until they just happen upon both an NPC and a safe zone. And yes, there are cases where the mapmaker is tucked away in infuriatingly obscure locations. Look, human brains aren’t built to navigate 2D spaces the same way they can navigate 3D ones. 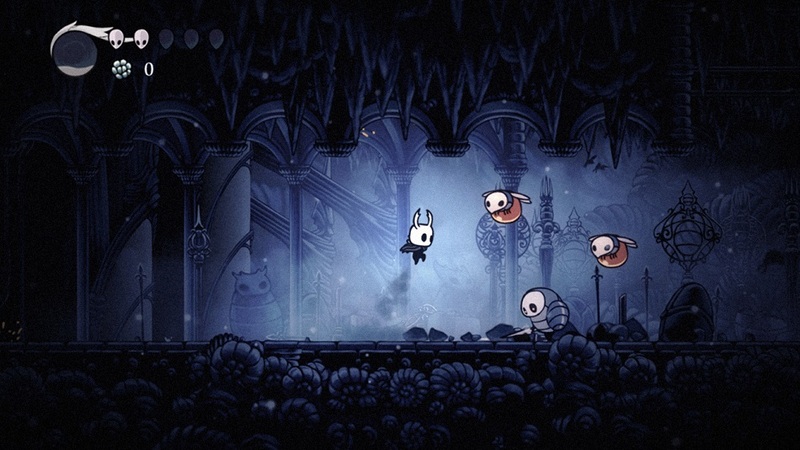 There’s no shame in putting a straightforward map system in a game like Hollow Knight. This doesn’t make it more challenging; it makes it tedious. Metroidvanias by nature lean heavily on backtracking, which I’m less inclined to do if I have no idea where I’m going. I’m supposed to be excited when I reach a new area in a game like this. In Hollow Knight, I was constantly dreading getting lost. This situation is not helped by the fact that Hollow Knight is unfathomably massive. It took me 30 hours to reach the end, and that was only with 72% completion. The world just keeps expanding – I would do routine cleanup for collectibles only to continually stumble upon enormous new areas. And as much as I want to applaud Team Cherry for such a generous helping of content, Hollow Knight simply doesn’t keep the energy going. It’s too bereft of surprises, and the regions barely differentiate beyond the aesthetics. Disclosures: This game is developed and published by Team Cherry. It is currently available on PC. This copy of the game was obtained via download and reviewed on the PC. Approximately 30 hours of play were devoted to the single-player mode, and the game was completed. There are no multiplayer modes. Parents: As of press time, this game has not been rated by the ESRB. It’s pure cartoon violence. There’s nothing remotely offensive about it. Deaf & Hard of Hearing Gamers: All dialog is text-based. One of the game’s collectibles emits a sound cue that makes them much easier to find, but that component of the game is optional. I literally said, in that quote, that FromSoft did the same thing, so I’m confused as to why you think I’m implying that they didn’t. 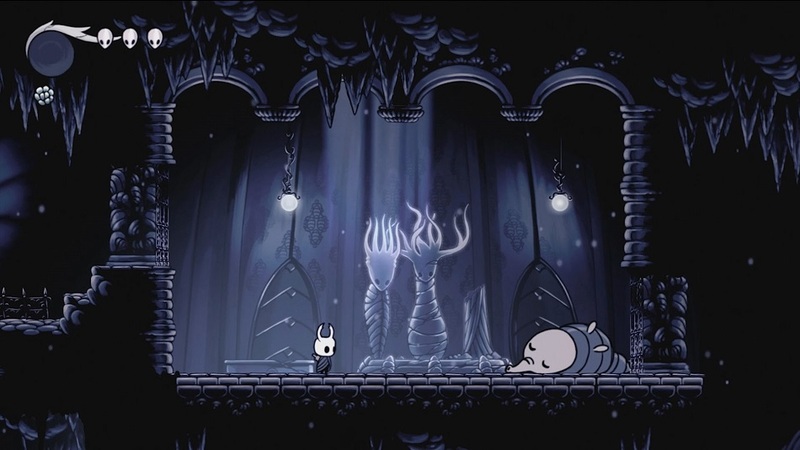 The difference – again, as I mentioned in that quote – is that Hollow Knight’s bosses have no cooldown times since nothing in this game runs on stamina. What exactly is the point of making me freeze every time I want to heal if I can’t reliably determine when I’m not vulnerable? It’s a handicap for its own sake. I’m burned out on Metroidvanias as well. I also agree that the map system is garbage. There’s no reason for the map system to be as inconvenient as it is. Not that I really care for Souls games anyway. They also follow the school of thought where inconvenience = difficulty. Game’s just not my thing. There were framerate drops in Breath of the Wild, but no hitching. There’s a difference; the latter means there’s a split-second in which I lose visual feedback while gameplay continues. That’s a significantly more severe flaw, particularly in a game as punishing as Hollow Knight. An enemy could attack me during that time.